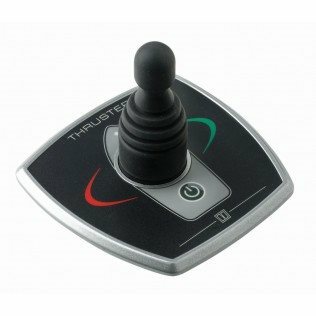 Control panels for bow thrusters can be supplied with push-buttons or a joystick: these are available with or without time delay. Wireless remote controls are also available. All panels are suitable for 12v or 24v operation and are IP65 watertight. Easy-Dock panel EZDOCKS Easy-Dock panel without without time-delay for bow thruster and stern thruster. Requires cables to connect to bow and stern thruster motors. Easy-Dock panel with time delay EZDOCK2 Easy-Dock panel without with time-delay for bow thruster and stern thruster. Requires cables to connect to bow and stern thruster motors. Time-delay 12v BPTD12 Time delay unit for panels without integral time delay. May be used with all Vetus bow thruster panels which do not have an integral time-delay.